There are two Byodo-in Temples in this world. The first one, the original, located in 16 Renge, Uji, Uji City, Kyoto Prefecture, Japan was built in year 998. The second is the replica, located on the island of O'ahu in Hawai'i. The replica was built by concrete (the original is wooden without the use of nails) in 1968 at its present location in the Valley of the Temples to celebrate the centennial anniversary of the arrival of Japanese culture to Hawai'i. The original Byodo-in Temple was built in the Heian period as a rural villa of high ranking courtier "Minamoto no Shigenobu", and converted into a Buddhist temple by "Fujiwara no Yorimichi" in 1052. Byodo-in Temple (平等院, Byōdōin) is a striking example of "Buddhist Pure Land" architecture. The temple represents the "Pure Land Paradise" and was influential together with the garden. As a tourists area, this complex became a favorite destination in Kyoto, especially for photography. The majestic garden centers around Phoenix Hall (鳳凰堂 Hōō-dō) as main object, located at center area which represent Amida Buddha's image. The Amida sculpture is made of Japanese cypress and is covered with gold leaf. The Phoenix Hall surrounding by Ajiike Pond and incorporates the natural scenery as foreground, and the clear water of the Uji River and the mountains as a background. 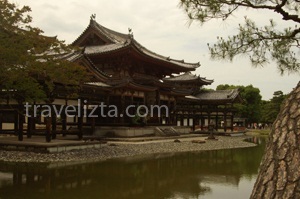 Byodo-in's buildings were repeatedly lost to fires and other calamities over the centuries, but the Phoenix Hall was never destroyed, and remain as original wooden structures which can survive from the Heian period. The Phoenix Hall consists of a main rectangular structure, flanked by two L-shaped wing corridors and a tail corridor at the edge of a large artificial pond. Japan commemorates Byodo-in's longevity and cultural significance by displaying its image on the 10 yen coin. The Byōdō-in museum, which located on the west wing, stores and displays most of Byōdō-in's national treasures, including 52 wooden Bodhisattvas, the temple bell, the south end Phoenix, and other historically noteworthy items. This complex is open at 8:30 a.m. - 5:30 p.m, with entrance fees 600 yen. 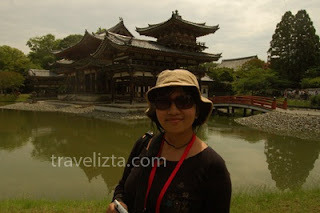 Search DISCOUNTED PRICE HOTELS in KYOTO Here!